Coho has arrived____Copper River Coho Salmon to be exact! It was not advertised as Copper River, so I requested that the fishmonger at Harris Teeter check the box____and thankfully it was Copper River so I could finish my final testing on the prized salmon. As I had learned with the Sockeye (if you remember in the previous blog) it pays to shop price. This time____Harris Teeter, $15.19____Whole Foods, $15.99. The clerk at Whole Foods was unable to determine if his product was Copper River and it was his assessment, the brand was a hype____he could not tell the difference. I thought to myself___more research needs to be done….it appears others have the opinion that in a blind-testing, one could not distinguish brands of wild-caught Alaskan salmon. But, the brand name Copper River has earned it’s reputation for quality. The fishermen protect it’s sustainability by respecting the source, trolling and pulling in the gill nets frequently. Copper River is 300 miles long and that distance is important because it requires exertion to travel to the spawning grounds. The salmon stop eating before making this pilgrimage, thus they build huge reserves of muscle and the much revered fat (omega-3’s). Copper River also offers the advantage in that it’s salmon is first to spawn, therefore first to market. First up and first out builds excitement and anticipation for the prized catch. 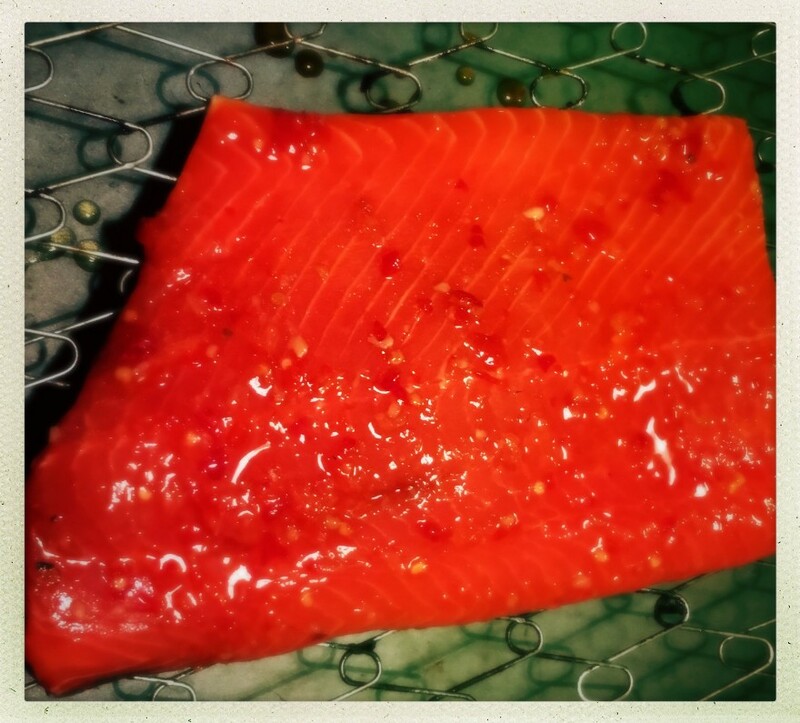 Grilled on the green egg in the same manner as the King and Sockeye (Tamari and Sweet Red Chili Sauce), the sweet in the sauce produces a perfect char to the bright red color of the Coho. I have learned worthwhile information in my quest in addition to eating healthfully. Is it worth the hype? In my opinion, YES! It is easy to “buy” into the hype. When a brand delivers consistently and reliably, I tend to become a loyal fan! 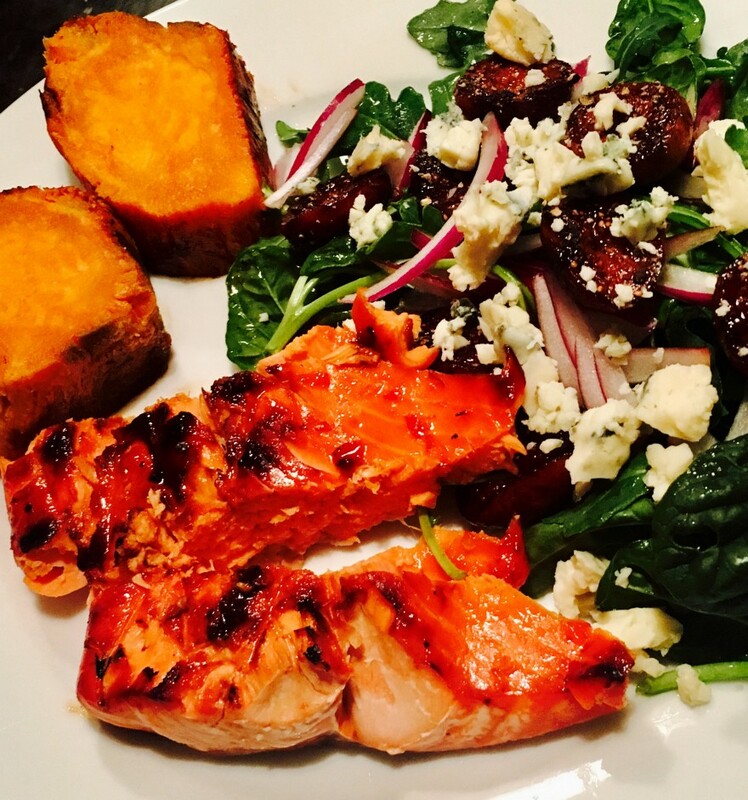 Hurry, if you want to experience this delicacy; the season for fresh Copper River Salmon is almost “Bye-Bye”!